Articles & Info » Poisoning Issues Specific to Young Children / Swan Plants - Educational Or Harmful? The swan plant is home to the Monarch caterpillar, and children are enthralled to see the butterfly emerge right in front of their eyes. How toxic is it and is it ok to have swan plants in the home? Why Are Swan Plants Special? The swan plant is a food source for the caterpillar of the Monarch butterfly and other butterflies of the Danaus species. 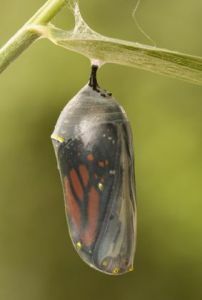 The lifecycle of the monarch butterfly is the main reason the swan plant is present in preschool centres as children can trace the changes from egg to caterpillar to chrysalis to butterfly. In older children the Monarch butterfly and caterpillar are often used as an introduction to scientific experiments. Swan plants (Gomphocarpus spp.) are toxic, and swallowing even a small amount could be a problem. Ingestion of the plant material can affect the heart, breathing, central nervous system and the stomach. Young children generally do not regard the plant material as attractive to eat, although they may find the pods (swans) fascinating. Often the chrysalis of the monarch may be ingested as they look similar to lollies. There is no poisoning concern with children eating the chrysalis. Is It Ok To Have Swan Plants In Child Care Centres Or In Homes With Young Children? Because of the educational benefits of teaching children about the lifecycle of the monarch butterfly, swan plants are not on the Landcare Research list of plants that should not be grown or tolerated in New Zealand preschool centres. Therefore, although it is a toxic plant, Swan plants can be grown in child care centres or homes with small children, providing supervisors are aware of the toxic nature of the plant, and take all necessary precautions to prevent poisoning from occuring. Grow swan plants in a container that can be removed to an area inaccessible to children when not being used. Another option is to place the swan plant in an open-topped bird cage so that the butterflies can get in and out, but children's hands can not get in. Specific First Aid Advice for Swan Plant Exposures- What Should I Do? Immediately seek medical advice from your Poisons Centre or your Doctor. It is not necessary to give any fluids. Do not make the person vomit.